The only “problem” with the whole thing though – the clothespin bag. Those are fine if you have a clothesline that you can hang it on and push it ahead of you as you pin your laundry up. But if you’re going around in circles, or reaching overhead or reeling line in your garage – sometimes the clothespin bag on the line just isn’t as convenient as it could be. 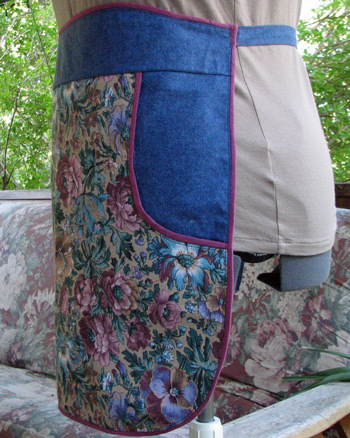 So – how about a clothespin apron?! 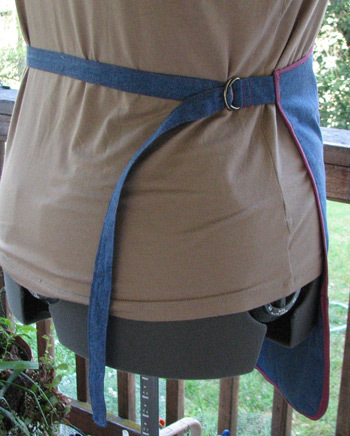 I made my mom’s a little bit different – instead of a cute little sash to tie, I decided to make kind of a “belt” out of the fabric I’d used for the apron and some D-rings. 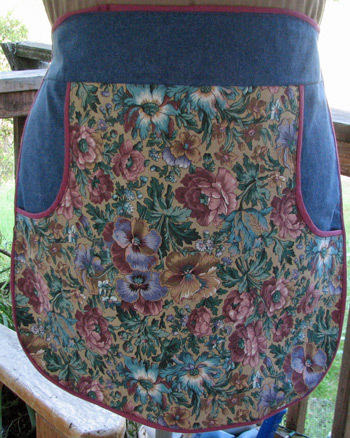 Since we were using quilting cotton type fabric, this apron has everything doubled – the pocket and the apron back – but if I were using a more substantial fabric like denim, canvas or a heavy twill, that would not have been necessary. The pockets are very easy to get into and take things out of without allowing the pins to spill out. You can even clip them to the pocket if you needed one handy. A bit more history on this little apron here. Oh boy oh boy oh boy, I can hardly wait for the mail. The clothes dryer I have is called The Breeze and got it from the internet. My husband and I get such a thrill watching the clothes go round like a bunch o kids on a merry-go-round. Ah yes, it’s the little things in life that makes a fella smile. I know I’m going to be ecstatic with my new clothespin apron. Previous post: Awww – so cute.